From left, Conestoga students Cooper Moore, Josiah Nolting, Dillon Leffler, Cassidy Hartig and Jasmine Rainey smile during the FBLA State Leadership Conference. The five Cougars traveled to Omaha for the Future Business Leaders of America event. 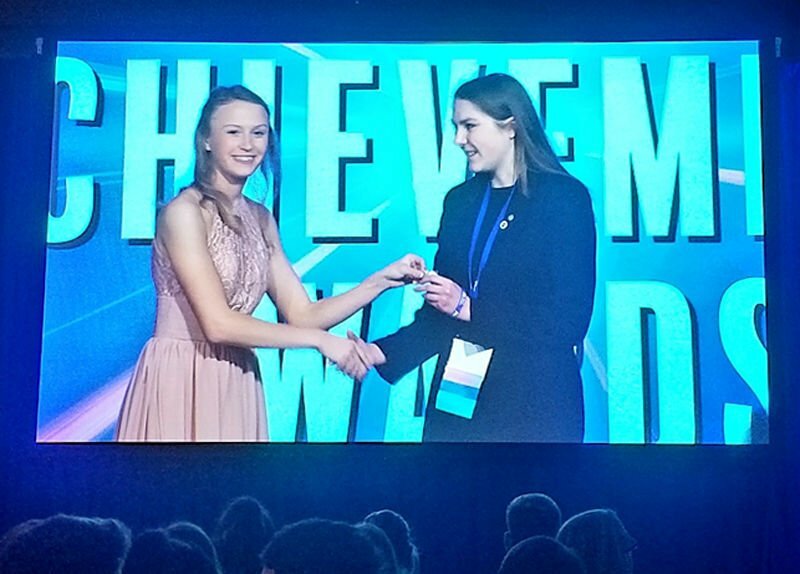 Conestoga FBLA member Cassidy Hartig receives her FBLA State Leadership Award from Nebraska FBLA Secretary Morgan Mills during an awards banquet. 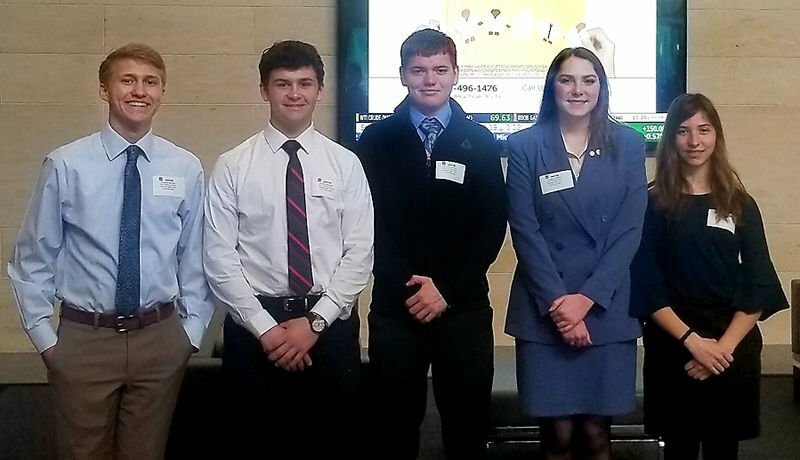 OMAHA – Five Conestoga students learned more about their future business careers this past week at a state conference in Omaha. Cooper Moore, Josiah Nolting, Dillon Leffler, Cassidy Hartig and Jasmine Rainey took part in the Future Business Leaders of America (FBLA) State Leadership Conference. They participated in competitive events, listened to professional speakers and networked with fellow students. Events took place at the Ramada Plaza Hotel and Convention Center April 4-6. Conestoga FBLA Advisor Jeff Brokaw said one of the highlights of the conference was a tour of the Union Pacific headquarters April 4. The Cougars listened to a panel of Union Pacific employees speak about the different careers they have with the company. They also heard how the recent flooding has affected Union Pacific’s business. Hartig earned a State FBLA Leadership Award at the convention. She was recognized for her work spearheading FBLA activities at Conestoga. Hartig also earned an Honorable Mention Award in the Business Communication category. She finished in the top 14 spots of a contest that included 341 students. Moore earned an eighth-place medal in the Advertising category. He finished in the top ten in a division that featured 351 participants.